Hair loss is never an irreversible phenomenon. It can be halted by specific treatments. Our Hair Loss Treatment Kit includes all our Hair Loss treatment products. Visible results after 3 months of treatment in the majority of cases. 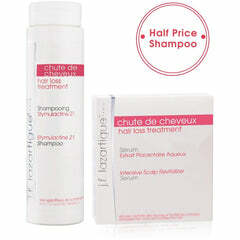 This treatment fortifies the roots and stimulates the growth of stronger hair. (Strongly recommended for new mothers.) This treatment is suitable for scalps that are normal, dry, irritated, or prone to dandruff. It contains Plant Placenta, a powerful regenerator which stimulates hair growth and strengthens the hair. The extract acts on the scalp and by capillary action nourishes the root, providing it with all the amino acids, trace elements, and vitamins essential for cell renewal. This non-greasy treatment spray is recommended for tired and deficient scalps, to combat severe hair loss and anemia. Silanols are one of the essential factors in the cellular activity of hair roots, contributing to the resistance of the hair and scalp. Regular application, at the onset of severe hair loss or as a preventive measure, encourages vigorous growth and quickly controls the harmful effects of seborrhea. Silanols and amino-acids, the high-tech ingredients contained in Stymulactine 21, vigorously fortify the production of healthy hair and improve capillary density. The ULTIMATE remedy for hair loss. This shampoo is recommended for lifeless, dull hair, and to anyone who periodically experiences an excessive hair loss. The plant glycoproteins have a stimulating effect on tissue respiration, the micro-capsules of phospholipids contain active compounds sourced from the sea as well as homotaurine that slows down hair loss and stimulates its regrowth. A compound derived from silanol helps to combat skin aging and enhance hair density. The Stymulactine 21 shampoo also contains anti-inflammatory, anti-oxidant, and repair products to enhance hair vitality. This food supplement nourishes and strengthens the hair (aspartam free - gelatine free ). The ideal nutritional supplement to compensate and complete dietary deficiencies, which all too often cause hair disorders and imbalances (hair loss, limp, lifeless or dull hair, etc.). This compound is based on energizing plant extracts (lemon zest, wheat germ, horseradish), protectors of the scalp in the form of trace elements (zinc), keratin precursors (sulphured amino acids of Cystein and Methionine), "anti-hair loss" vitamins of the B group (B2, B5 and B8) and "stimulating" vitamins (A and E).